An elephant was killed after being mowed down by the Guwahati-Ledo Intercity Express train near Lumding in Hojai district of Assam on Monday. As per reports, the deceased elephant was one among a herd of ten elephants crossing the railway tracks. The jumbo left behind by the group was killed after being knocked down by the train. 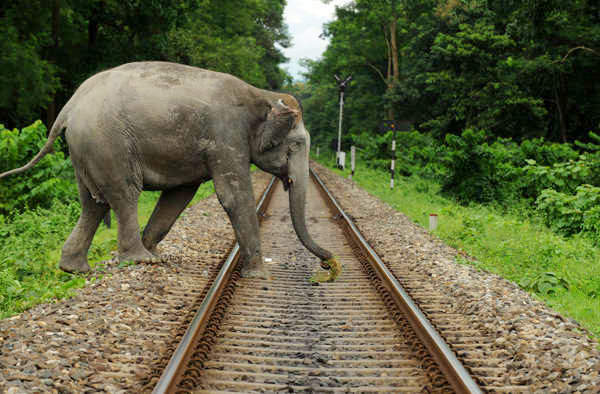 The other nine elephants who were crossing the railway tracks managed to get away safely. Officials of the forest department rushed to the spot to recover the carcass after receiving information. They soon launched an investigation into the incident. Reports quoted a local person of the area as saying that the elephant was crossing the railway tracks with its herd when the incident occurred. Also read:Guwahati: Army starts removing iron spikes claiming wild elephants! He also said that while all the other elephants managed to cross the tracks, the jumbo was left behind and died after being hit by the train. Last year, four jumbos were killed and another injured after being mowed down by the Guwahati-bound Silchar Passenger train near Hawaipur Station in the Lanka area under Hojai district. It may be mentioned that three wild elephants of a herd, including two pregnant females, were killed by the speeding Kanyakumari-Dibrugarh Vivek Express when they were crossing the railway track at Hojai in December in 2016. “One of the elephants was a 4-year-old female, while 2 others were pregnant. One of them aborted a 2-month-old fetus after the accident and we found a 4-month-old fetus inside the other while conducting post mortem,” a local forest officer had said.